Now with the OvaScope High Intensity egg scope you can watch the live embryo develop inside even very dark or mottled eggs. The OvaScope High Intensity egg candler has a higher light output from a higher spec LED than the standard OvaScope. This innovative aid to egg candling improves the clarity and visibility of the egg and its contents by completely blocking out ambient light, slightly magnifying the image of the egg and allowing the viewer to rotate the egg smoothly as it is observed. 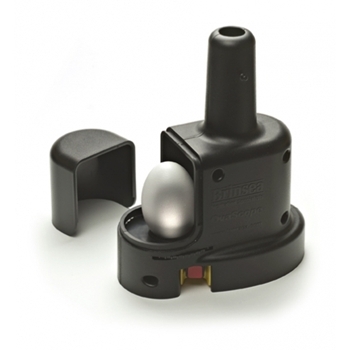 Battery powered for convenience (4 AA batteries NOT included) the OvaScope High Intensity egg candler uses high output high efficiency LED illumination – so no bulbs to replace and no concerns about overheating the eggs during inspection. Suitable for any size egg up to duck/turkey eggs. Supplied with a small black ring to seal against the egg shell of smaller eggs. The OvaScope High Intensity egg candler can be fitted with a webcam and is ideal for demonstration purposes or classroom use. The larger power drain means that rechargeable batteries are needed. Suitable sets of batteries with charger are available separately.